Includes one Milk Chocolate Caramel Nut Egg, one Milk Chocolate Peanut Gianduia Egg, and a Milk Chocolate Hazelnut Crunch Egg. 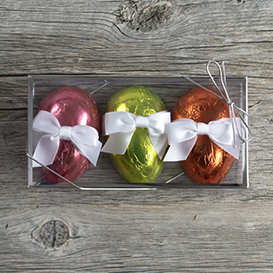 This trio of nutty, buttery, handcrafted Truffle Eggs is sure to brighten up your Easter basket. Milk Chocolate Caramel Nut Egg: Caramel (Corn Syrup, Sugar, Milk, Fructose, Hydrogenated Coconut Oil, Butter, Mono- and Diglycerides, Salt, Soy Lecithin, Vanillin), Milk Chocolate (Sugar, Cocoa Butter, Milk Powder, Cocoa Mass, Barley Malt Extract, Soy Lecithin, Vanilla), Cashews, Salt. Milk Chocolate Peanut Gianduia Egg: Milk Chocolate (Sugar, Cocoa Butter, Whole Milk Powder, Cocoa Mass, Lactose, Skim Milk Powder, Barley Malt Extract, Soy Lecithin, Vanilla), Peanuts, Sugar, Coconut Oil, Cocoa Butter. Milk Chocolate Hazelnut Crunch Egg: Milk Chocolate (Sugar, Cocoa Butter, Whole Milk Powder, Cocoa Mass, Lactose, Skim Milk Powder, Barley Malt Extract, Soy Lecithin, Vanilla), Sugar, Hazelnuts, Coconut Oil, Cocoa Butter.